From November 23rd to 25th, 20 citizen, interfaith and intercultural dialogue organizations came together in Paris for the first “Connecting Actions” symposium. Hailing from 13 countries, the participants shared their diagnostics of the particular challenges in their national contexts, but also global developments such as the continuing rise of populism, nationalism and extremism. Furthermore, the relevance and value of dialogue projects for addressing those challenges were identified and debated. The participants concluded that interfaith and intercultural dialogue is to be taken seriously, and understood as key to addressing polarization, extremism and racism. On the basis of this, a clear desire for continuing to exchange best practices and reinforce each other’s work was identified. A follow-up conference is planned for the end of next year and an internal, virtual platform will serve to sustain the flow of information, experience and support. Several joint initiatives were discussed amongst participating organizations. For Linda Vignac, President of SIETAR France, “This initiative is important because it proposes to take active steps towards living together in a diverse world which I think is the only viable future for the world. Recent events make it obvious that not everyone agrees with this concept”. “For decades now, forces who divide us along the lines of nationality, religious belief and cultural identity have organized and exchanged knowledge and experience. It is time to do the same. 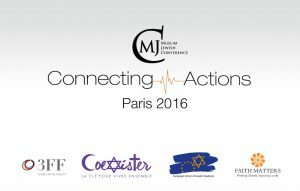 Connecting Actions is a vital step in building innovative networks of cooperation among useful and much needed national and international initiatives” according to Ilja Sichrovsky, Secretary General of the Muslim Jewish Conference. “The coalitions that this movement will allow are the best prevention tools for the multiple clashes that riddle our social fabric”, adds Rafael Tyszblat, organiser of the event.